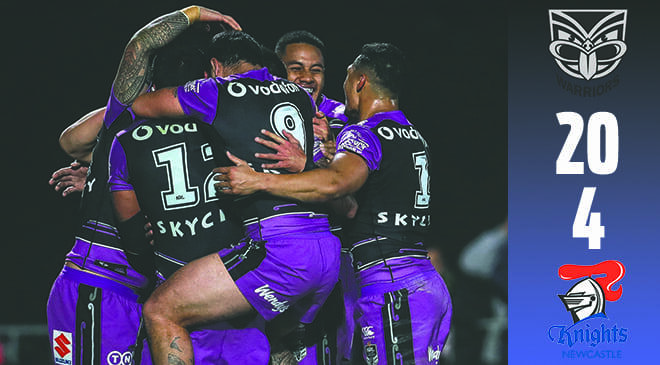 Roger Tuivasa-Sheck ran 300 metres in an inspired performance which led New Zealand Warriors to a 20-4 victory over Newcastle Knights. The win goes some way to securing their place in the top eight for the first time since 2011. The Knights scored the first try when Mitchell Pearce’s forward pass wasn’t spotted and Ken Sio did excellently to beat multiple defenders to ground the ball. The Warriors replied when several offloads led to Adam Blair diving across. Then David Fusitu’a got over the line on the right wing when he was able to bump away from the sliding Kalyn Ponga. New Zealand gained full control of the game when Blake Green dummied and ran in under the posts eleven minutes into the second half. Shaun Johnson finished off the win with a penalty with a few minutes to play.